I sometimes dread pulling out leftovers, but not leftovers like this. I can just pop them in the oven to heat up, and it feels like convenience food. There was no more whipped cream – those little boxes barely make enough for one breakfast for us – so we topped them with bananas and honey. Our house helper cooks lunch for us each day. I generally just let her choose whatever looks good at the market. I told her we don’t eat a ton of meat, and that it would be fine to use as much meat as she would normally use for her family. So, we’ve ended up with dishes that aren’t meat-heavy, or don’t have meat at all. 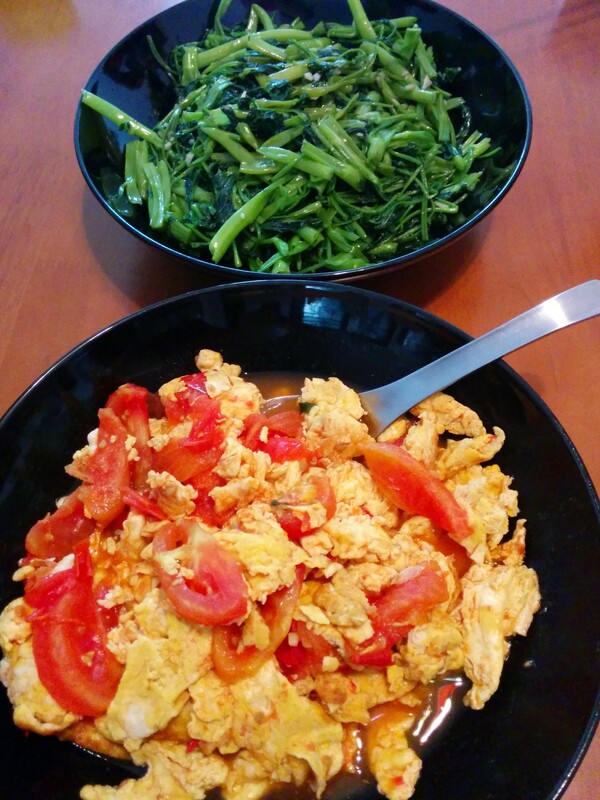 For example, today was a standard Chinese dish: tomato and eggs. 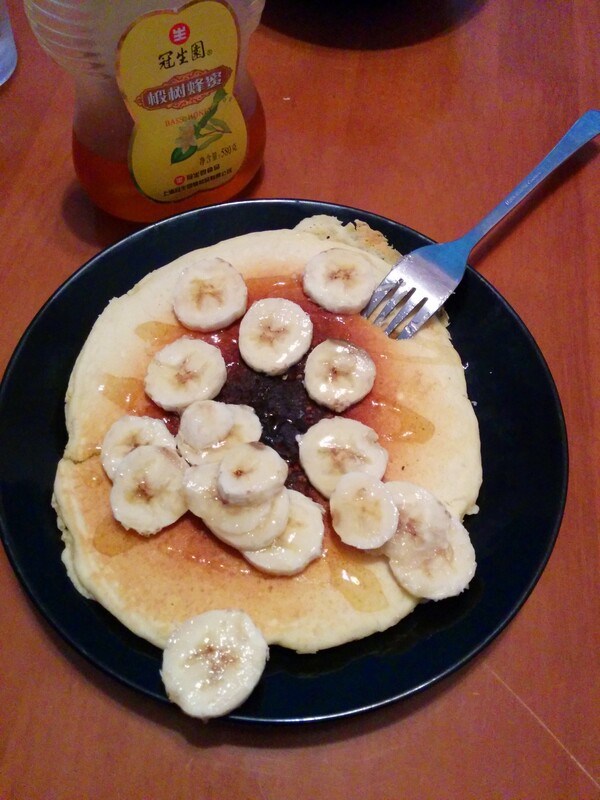 Basic, but delicious. These dishes are served with steamed white rice. I’ve heard white rice is fattening, but this continent hasn’t gotten the news yet. This is what we were supposed to have the night before, when the power was out. I sniffed the chicken to make sure it hadn’t gone bad with the fridge off all day, and it seemed fine. 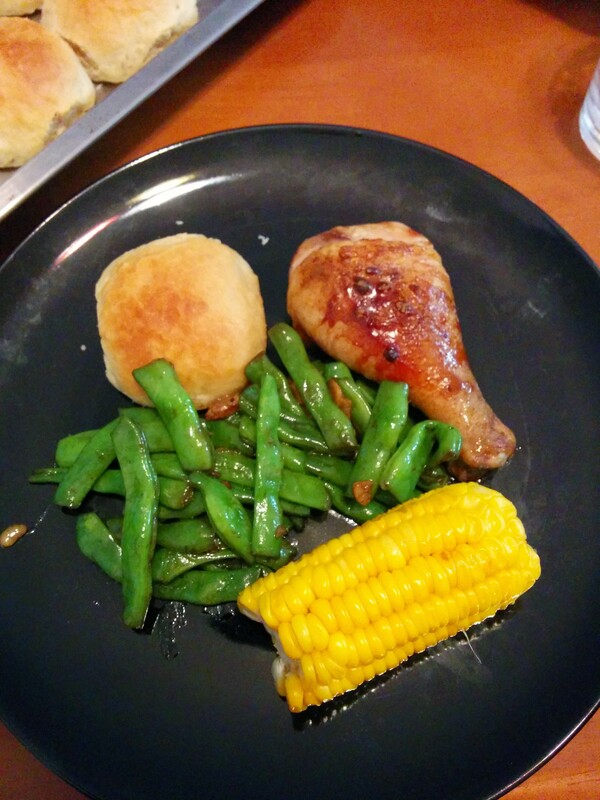 Here are the results: baked chicken, topped with soy sauce, salt, pepper, and brown sugar; green beans with garlic; leftover homemade rolls, warmed from the freezer; and corn on the cob, eaten Asian style with no butter or salt. Does this count as fusion cuisine? You can read the story of the “Frankenstein of an apple pie” in this post. And, what about that power outage yesterday? Well, this morning Eric was walking past the front gate of our apartment complex and saw a sign. It was notifying residents of a scheduled power outage on Sunday from 8 a.m. – 6 p.m. Whoops. The drama and romance continue on Day 3! I loved kongxin cai! I miss the plentiful green veggies, oh and of course the inexpensive meals at restaurants. I agree, Darla! I miss the qing cai (greens) when I’m in the States.